Christmas markets are a​ beloved holiday tradition in Vancouver and the best way to shop local for the winter holidays. 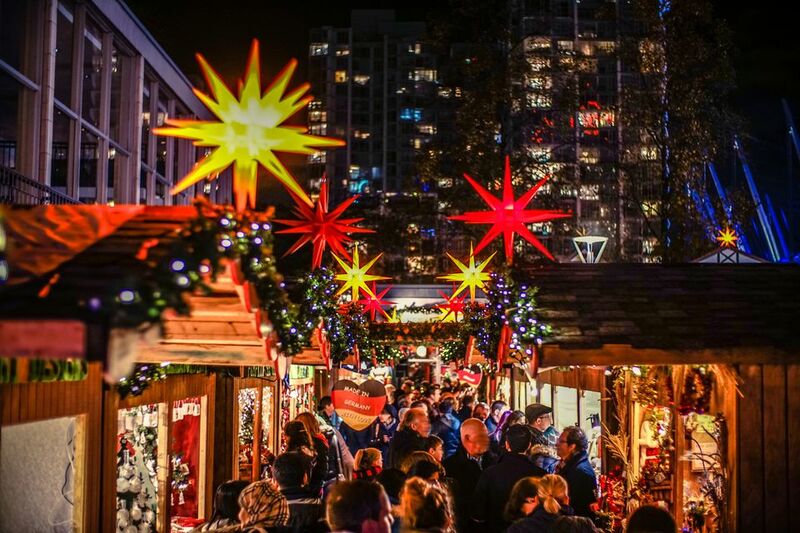 At the biggest Vancouver Christmas markets, visitors will find hundreds of artists and artisans selling an array of local- and British Columbia-made crafts, fine art objects, home decor, fashion, winter wear, toys, jewelry, ceramics, and gourmet foods. These markets are the perfect place to shop for yourself, your home, and for unique gifts that can't be found anywhere else in the world. Check out the top six Christmas and crafts markets in Vancouver and their dates for 2018. While it's fun to browse the wares, ranging from organic baby clothes to pottery, the Vancouver Christmas Market is a fun experience, period, especially after 5 p.m., when Christmas lights brighten up the night sky. Returning in 2018 is the Walk-In Christmas Tree, a 30-foot tree with 36,000 lights that visitors can walk inside. The University Women’s Club of Vancouver's annual fundraiser, Christmas at Hycroft, is a longtime Vancouver holiday tradition. Unlike other Vancouver Christmas markets, this one combines unusual gifts with abundant charm and sense of place: In addition to shopping, visitors get to tour the historic Edwardian Hycroft mansion, which is usually closed to the public, decked out in all its Christmas glory. Christmas at Hycroft takes place Nov. 15 through 18 in 2018. Though not a typical Vancouver Christmas market—this hip, modern craft market is a great place to shop for interesting presents for the holidays. Dedicated to showcasing unique, ethically made goods from local and Canadian artisans, the Make It Vancouver market includes handmade gifts, paper arts, kids' clothes, fashion, jewelry, and art. It takes place at the PNE Forum Dec. 12 through 16, 2018. One of the best Vancouver Christmas markets, Got Craft? is a semi-annual craft fair held in May and December that showcases more than 50 local artists and artisans. Vendors' offerings include jewelry, clothing, bath and body items, paper arts, ceramics, fine art, and food. Got Craft? will be open on Dec. 8 and 9, 2018, at the Maritime Labour Centre. This annual curated art show featuring 30 local artists and their creations and designs happens just in time for holiday shopping. This two-day event, on Dec. 8 and 9, 2018, at Heritage Hall, features work of British Columbian artists that includes paintings, ceramics, wearable art, and sculpture.